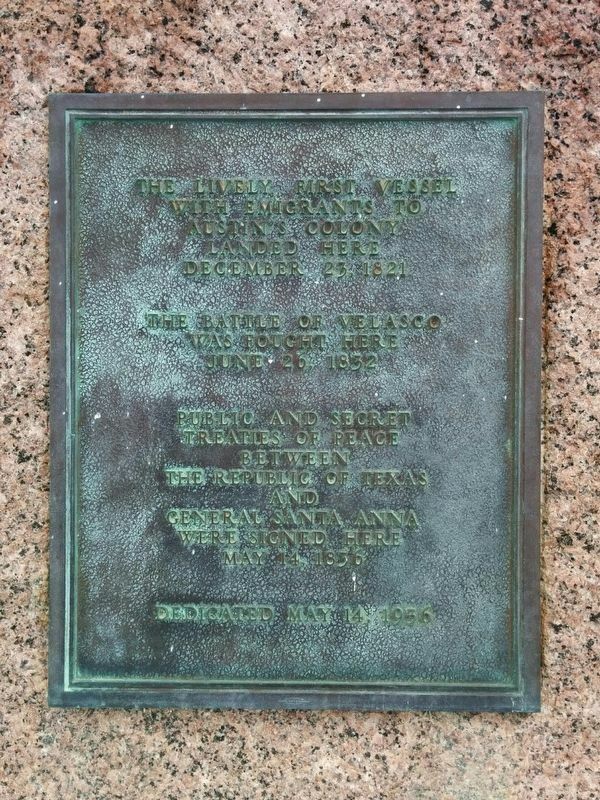 First vessel with emigrants to Austin's colony landed here December 23, 1821. The Battle of Velasco was fought here June 26, 1832. Public and secret treaties of peace between the Republic of Texas and General Santa Anna were signed here May 14, 1836. Location. 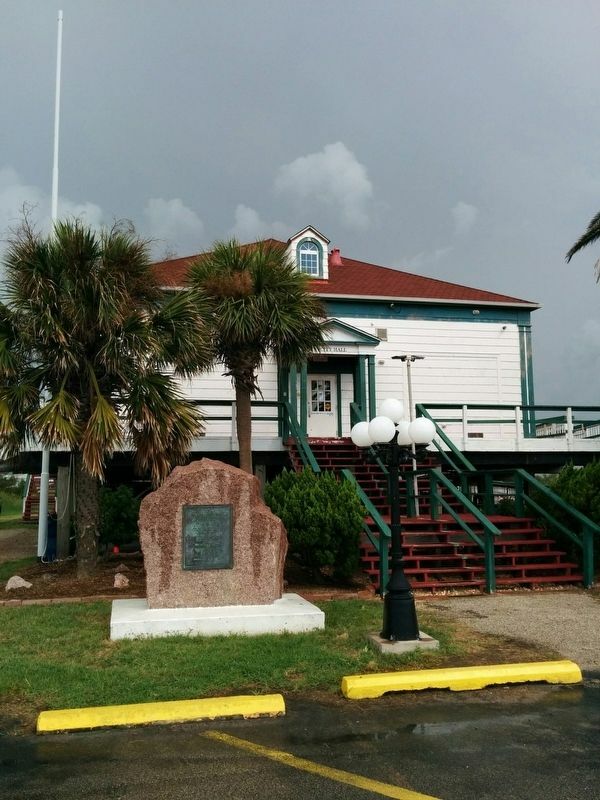 28° 56.56′ N, 95° 17.976′ W. Marker is in Surfside Beach, Texas, in Brazoria County. Marker is on Monument Drive west of Jettyview Road, on the right when traveling west. Touch for map. Marker is at or near this postal address: 1304 Monument Drive, Freeport TX 77541, United States of America. Touch for directions. Other nearby markers. At least 8 other markers are within 11 miles of this marker, measured as the crow flies. Old Quintana (approx. 0.8 miles away); Gulf Intracoastal Waterway (approx. one mile away); Old Velasco, CSA (approx. one mile away); Historical Jetties (approx. one mile away); Velasco (approx. one mile away); Freeport National Bank (approx. 2.9 miles away); Stringfellow Ranch (approx. 7.7 miles away); Battle of Jones Creek (approx. 10.7 miles away). Touch for a list and map of all markers in Surfside Beach. More. Search the internet for The Lively. Credits. This page was last revised on August 1, 2016. This page originally submitted on July 30, 2016, by Gregory Walker of La Grange, Texas. This page has been viewed 242 times since then and 7 times this year. Photos: 1, 2. submitted on July 30, 2016, by Gregory Walker of La Grange, Texas. • Bernard Fisher was the editor who published this page.